Great blurb on toner and a nice product suggestion! Toners are meant to remove all remaining traces of oil, makeup and dirt, but a good cleanser should do this. I believe it’s up to you. If you like the way your skin feels with a toner, buy it. Use it. Enjoy it! Can I be honest? I always thought toner was stupid. Why, when I’m going to wash my face anyway, do I need to add one more cotton ball to a landfill in the process of rubbing some alcohol-y thing on my face? Well, I just woke up people. It’s hot outside and toner is awesome - if it’s the right toner, applied in the right way. Remember when you would just walk through a sprinkler on the way home from school like it was no thang? I’ve been recreating that at my desk. Read on. 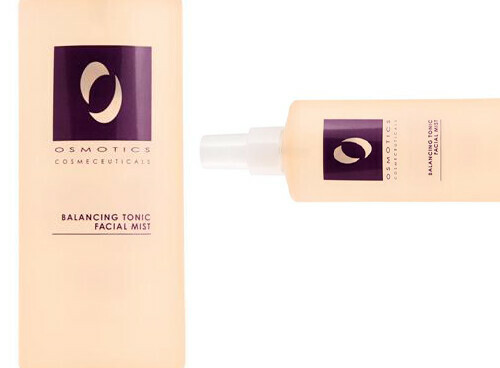 I experienced Osmotics Skincare recently at Henri Bendel. The founder, Francine Porter, is something of a cosmeceutical pioneer, and the line is based on clinically validated technologies. The product I fell in love with/cannot stop spraying all over myself is actually quite simple, though. It’s the Balancing Tonic Facial Mist with sandalwood, lavender and aloe vera. It hydrates, normalizes oil production, and is antibacterial i.e. for the second you get off the subway. It smells utterly fresh, natural and relaxing with a tinge of this hippy-ish summer scent vibe that I cannot get enough of lately. P.S. I also use the Eye Surgery Under Eye Rejuvenator, if you’re looking for an eye cream ($68). It’s really light and it doesn’t irritate my eyes like so many eye products.